Get flooring that embodies the perfect balance between beauty and function by choosing tile flooring in Twin Falls, ID. This durable surfacing solution is designed to withstand the most common forms of damage experienced in the home. The natural characteristics of tile guarantees this material will deliver the look and longevity you expect from your new floor covering. Our flooring showroom is proud to offer one of the area’s largest selections of tile in ceramic, porcelain, and slate. With countless different shapes and styles to choose from, you are sure to find a tile solution that satisfies in all respects. Whether you wish to place tile in a single room or throughout the entire home, you can find stunning choices among the huge selection at Beams Flooring America. Shopping for new tile floors doesn’t have to be a challenge. Turn to us and make the selection process easy and even enjoyable. Our in-store associates go above and beyond to make every experience at our location completely worry-free. By taking the time to ask the important questions, we become familiar with your unique expectations. No matter what you have in mind in regard to appearance, performance, or price, you can depend on us to deliver tile flooring that fulfills every desire. Ceramic -- This type of style is best described as elegant. Ceramic tile brings with it a refined look that lends its beauty to your furnishings. Made of kiln-fired clay, this tile is strong, water-resistant, and durable. It carries the lowest price tag of our tile selections and offers easy installation as it’s a softer tile, making it easier to cut. Porcelain -- For a thoroughly modern look that complements every décor, we recommend porcelain tile. Made of clay, quartz, and feldspar and fired in a kiln, porcelain is tough. You can count on it to stand up to heavy foot traffic and remain appealing for years and years. 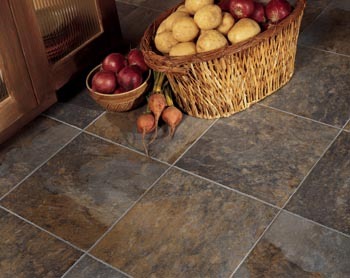 Slate -- Natural stone is what gives slate tile flooring its distinctive beauty. This type of tile is heavy and dense, enabling it to stand up to the wear and tear of daily life. With its earthy tones ranging from gold to green to blue and gray, slate offers a rustic appeal. As the tile is made from slabs mined from the ground, each tile is uniquely beautiful. Why Choose Tile Floor Coverings? Our commitment to your satisfaction doesn’t end when you make a purchase. We continue to provide you with exceptional service even after you walk away with the floors of your dreams. By providing tile installation on your behalf, we ensure the investment continues to impress far into the future. To achieve the long-lasting tile you desire, it is essential you invest in a quality product, along with quality installation. This is why we only entrust our clients’ floors into the hands of those with years of hands-on experience. Sooner than you ever thought possible, you can start enjoying new and improve tile in the kitchen, bathroom, living room, and beyond. We remain so confident in the workmanship of our installers that we back their efforts with unparalleled guarantees and warranties. If you choose one of our 4- or 5-Star products, you get to take advantage of the Confidence Plus Warranty. According to the warranty, if you aren’t 100% satisfied in your floors after 30 days of the initial install, we’ll replace them with a similar product for free. Now is the time to learn more about improving your home with new ceramic tile. Call <PHONE> or use the on-page form to discover the selection of ceramic available from our store. Contact us today we provide tile selection and service throughout Twin Falls, Mountain Home, Challis, Sun Valley, and Stanley, Idaho, as well as the surrounding areas.